Roast chicken evokes thoughts of a simpler time when Sunday dinner was an event and the dishes had to be dried before The Ed Sullivan Show started. For years in my house, the only time a whole cooked chicken was on my table was if I bought one of those rotisserie deals at the grocery store. I felt I just didn’t have the time that Grandma did to invest in roasting a chicken myself. Then I discovered a secret: roasting a chicken is easy. Rub some oil on it. Stuff some veggies in it and put it in the oven. There’s nothing left to do but eat it a couple of hours later. Oftentimes when I am roasting chicken, I will roast two. 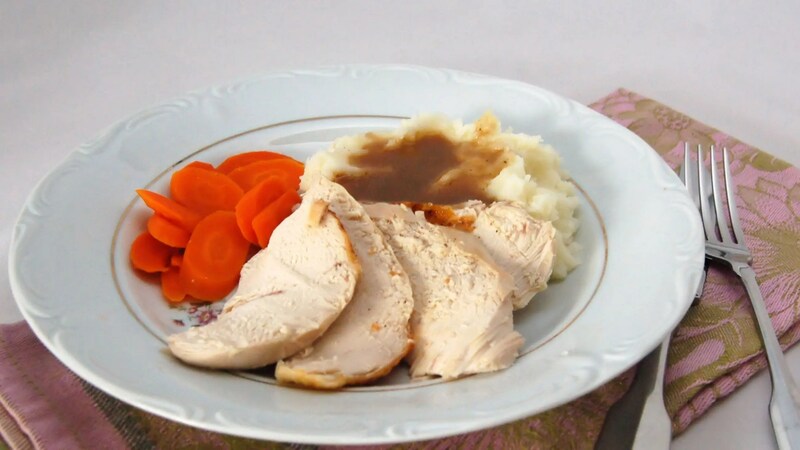 For one dinner I will often serve a traditional roast chicken dinner, with mashed potatoes and pan gravy. With the rest of the cooked chicken, I am ready to make salads, pot pie, fajitas and chicken sandwiches. So in the end, not only is the roast chicken easy on the cook, it’s a time saver! If I am not going to use up all the chicken in 3-4 days I cut it up and pop it in the freezer. Let’s start by getting the ingredients ready. Juice the lemon but be sure to hold on to the rinds as we’ll stuff them into the cavity of the chicken for extra flavor. Check out my nifty new lemon juicer. I just bought it at the Walmart and I love it. It almost turns the lemon inside out it juices it so well. 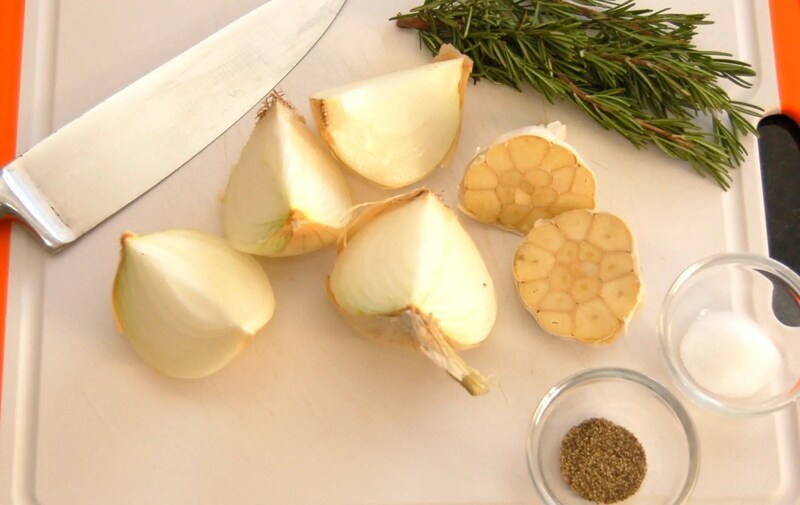 Next cut the clove of garlic and onion in half. My onion was large so I cut it in quarters. Don’t worry about taking the skin of the garlic or onion, it’s fine to leave it on. Now I am going to dive in head first to some chicken controversy. I rinse my chicken. I rinse my chicken inside and out and pat it dry. This is contrary to the advice of the FDA that says that if you rinse your chicken, you risk splashing bacteria all over your kitchen. They just advise to pat your chicken dry after you take it out of the package. 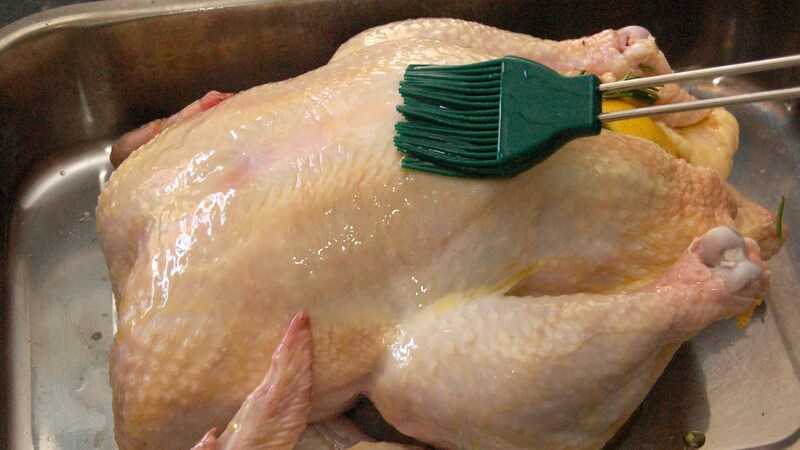 The FDA says that cooking will kill any bacteria that might be on the chicken. 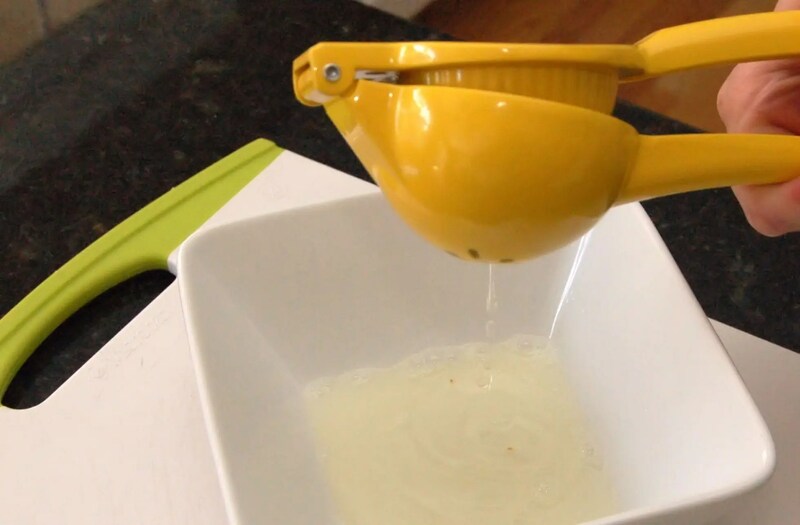 When I rinse my chicken I make sure not to spray water all over the place and I make sure there is nothing near by to contaminate (like clean dishes, towels or other food). After the chicken is in the pan I clean up with a bit of bleach in the water. Maybe one day I will start listening to the government but not today. You just need to do what is right for you. irregardless if you rinse or just pat dry, make sure you get up close and personal with the chicken and stick your hand in there and remove the giblets. Next, you need to season the inside of the chicken with salt and pepper. I usually put my salt and pepper mixed into a little dish so I don’t have to worry about contaminating the shakers with chicken-y hands! Don’t skimp. Then stuff the garlic, onion. 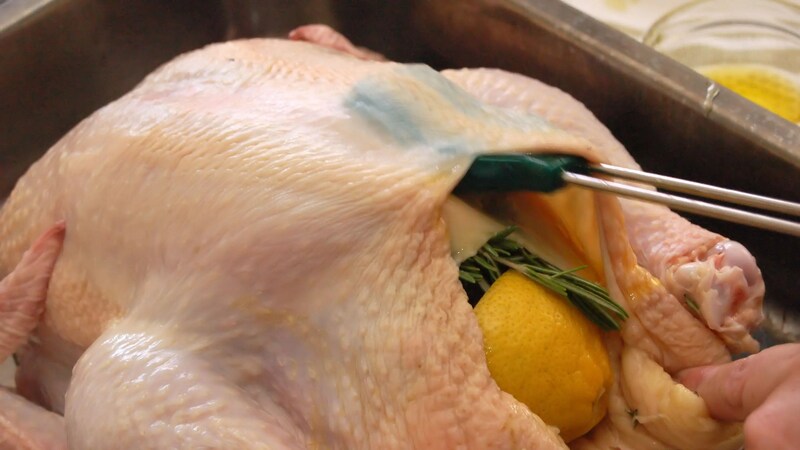 lemon and rosemary inside the cavity. If you don’t have room for all the onion just put it in the pan beside the chicken! Now add a little olive oil under the skin next to the chicken breast. Notice the membrane in the picture? It’s right there when you first lift the skin it’s easy to poke through then voila you’re under the skin! I usually use a pastry brush to brush to add the oil. 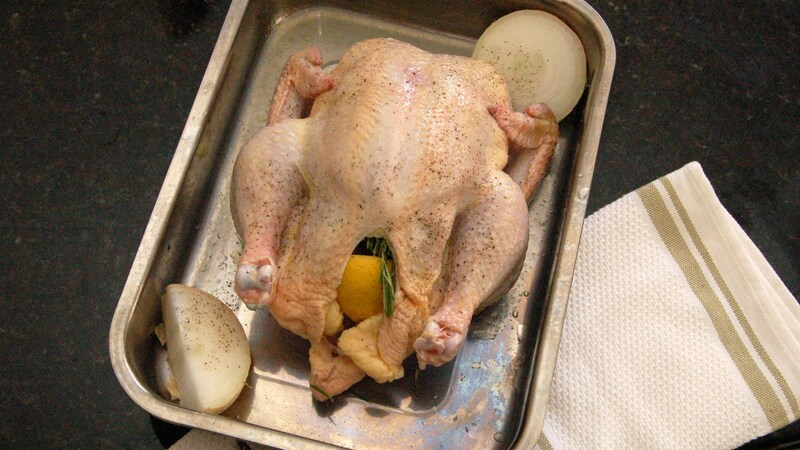 Now brush the entire outside of the chicken with the olive oil. Once your done giving the chicken a little olive oil love, sprinkle the chicken with the lemon juice. Then finish liberally with salt and pepper. Now your bird is ready for the oven. Roast the chicken in your preheated oven to 375f. You might also notice I don’t truss or tie the chicken legs together. I just don’t notice a big difference in cooking a small chicken if I tie the legs together or not so it’s a step I leave out. If you want to try it, just use some cotton kitchen twine. The chicken I cooked was just under 6 pounds and it was ready in about an hour and thirty minutes, but that will vary depending on your oven. I always recommend using a meat thermometer. It takes away the guesswork. Just insert the thermometer into the thickest part of the thigh without touching the bone. When it gets to 165f it’s time to remove the chicken from the oven! 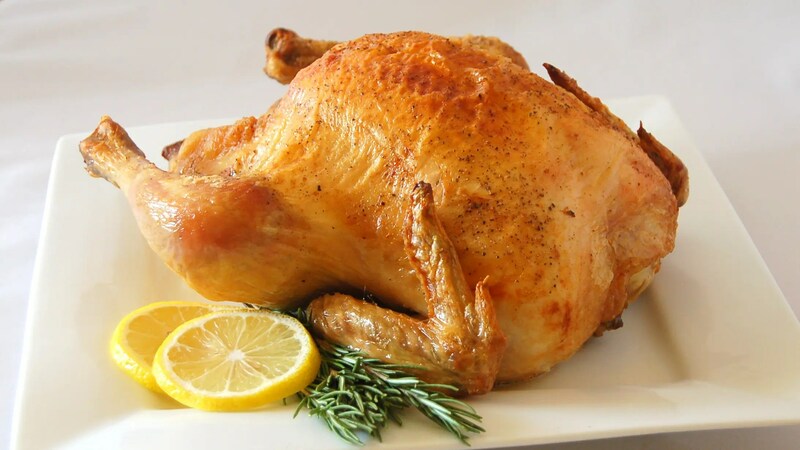 After you are finished roasting your chicken the most important thing is to let that chicken rest. When you let the chicken rest it helps to keep the juice in the meat instead of on the cutting board. You will also noticed that a rested chicken is much easier to carve. It’s a win win situation! I usually let the chicken rest 20 to 30 minutes. Nothing like a good old fashioned chicken dinner. Yum! Leftovers are great for salad, quesadillas and chicken pot pie! I made this last night. It was so moist and tasty ! Your chicken looks so good it made my mouth water and mine came out looking just as good. This is a wonderfully easy recipe. The kind I love. Its going to be easy to pop three in the oven for guests and it will look like I really fussed.